So at the expense of revealing how ancient I really am, I want to make it clear that Japan had their own coffee houses long before there was a Starbucks, which as everyone knows, is a big part of what makes Seattle famous–and where tourists come by the thousands just to stand in line to get into the “original” one. 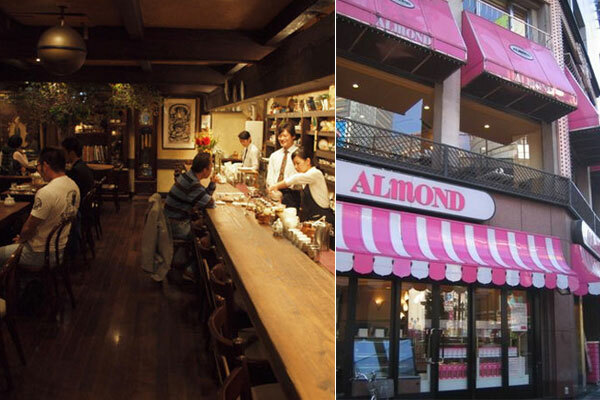 Of course, Japan probably borrowed the idea from the European cafés anyway, but the Japanese have a unique way of taking something and refining it somehow. In the 70’s, when coffee shops called kissaten really took off, there were thousands of mostly Mom and Pop places all over country. They would serve gourmet coffee, brewed carefully and individually, from beans imported from all over the world. Sound familiar? 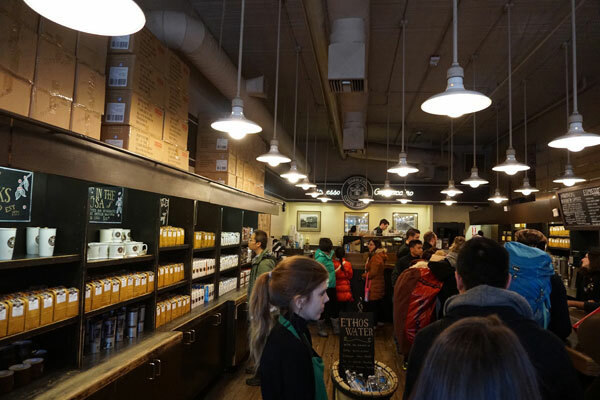 Just for some perspective, the first Starbucks store didn’t open until 1971, and they weren’t on every street corner back then. Load beans, grind, open drawer to get coffee! 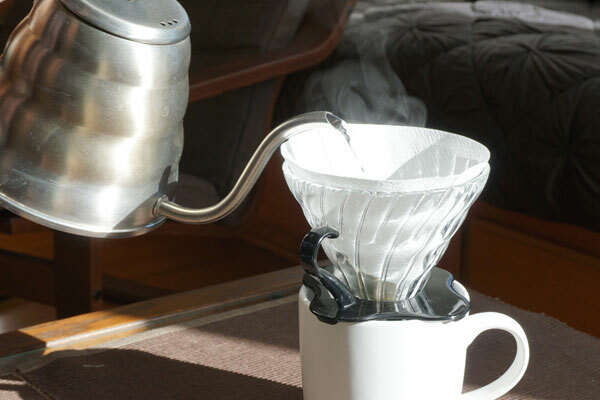 For my money, the Pour-Over (pictured above) is still the best way to brew a great cup of coffee. 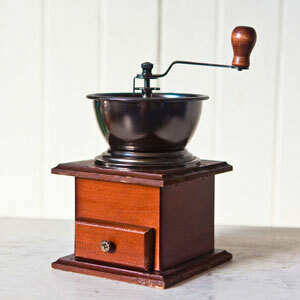 Perfect for a single cup, it makes me wish I still had my wooden mill that I used to have, when I would grind my own beans every morning. Nah, who am I fooling? It’s too easy to have it ground for me at my local Starbucks! I also had my own personal Siphon coffee maker too, which came with a little alcohol burner to heat the water. I remember first seeing this method at one of the fashionable coffee shops in Tokyo (yes, back in the Seventies) where the barista would tend to 6 or so glass pots, each boiling over a Bunsen burner. After watching the water boil and rise to the upper chamber, each pot of coffee was on a timer, set to go off at the ideal brewing time before being allowed to be taken off the heat and drop down to the bottom chamber for that perfect cup. It’s hard to fully understand the process until you’ve seen it, but it’s one of the most fun ways to brew coffee, and the brew is delicious! Then there’s the French Press, which has its fans, but I am not one of them. The idea is to brew the coffee in the glass with the grounds and the hot water, with the plunger all the way up. When your coffee is done, you simply push the plunger down and a built-in filter pushes the grounds down to bottom, leaving your coffee ready to pour. Many people like the fact that there is no paper filter to throw away, but I dislike cloudy coffee; and sediment always remains with the French Press. Purists will argue that the flavorful oils of the coffee beans are protected better with this method. In 1972 after Mr. Coffee® introduced America to automatic brewing for the home, there have been hundreds of automatic coffee brewing systems that heat and drip the water into a cone or basket filter, which then drips into a carafe. The machine is basically a home version of the machines that have been used in diners for decades, and is ideal for when you want more than one cup of coffee. Some of the good ones like this one from Zojirushi have thermal insulated carafes that can keep your coffee hot for hours, without having to keep it on a heating element. 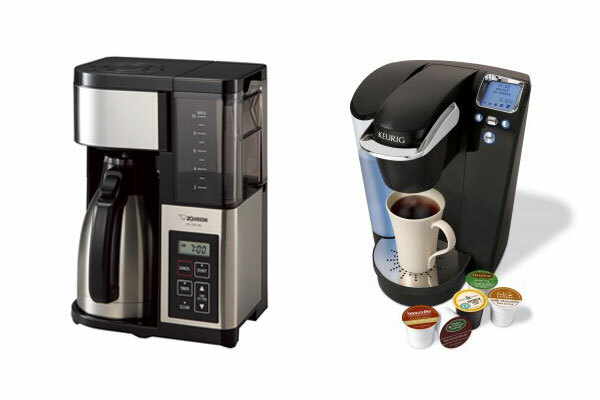 And I can’t discuss coffee brewing systems without mentioning the ubiquitous pod coffee makers made popular by Keurig®. It doesn’t beat the drip style coffee in my opinion, but it does make a pretty good cup. The company has taken some heat though, for impacting the environment with waste caused by their used pods. As modern convenience goes, it’s not surprising that you see these everywhere. Unlike a drip system, there’s not much to wash and nothing messy to dispose, other than that little pod. The last method I wanted to bring up was the Drip Sachet, a beautifully engineered drip coffee bag, made to hang on a mug or coffee cup for a single serving. This ingenious marvel of paper die-cutting folds completely flat while it seals the correct portion of fine ground. Carefully unfold it to expose the coffee, prop it securely over your cup, and just pour the hot water–a complete drip system in miniature! From a per serving price point, it’s a little expensive, but so convenient! To me, it’s the best tasting “individual serving” method other than the Pour-Over. 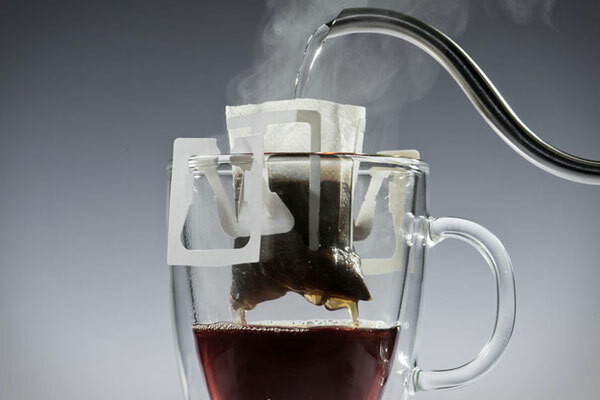 The coffee sachet folds out into a complete brewing system. I’m also old enough to remember the Percolator (Google it if you’re interested); my parents had this high tech electric one when I was a kid. Coffee has come a long way indeed. An imagawa-yaki or a taiyaki? If you haven’t, then it should be added to your street food bucket list! Imagawa-yaki is a grilled, stuffed pastry popularly thought to have originated during the Edo Period in the early 1800’s in a bakery located near the Imagawa Bridge in Tokyo. Many variations of the original imagawa-yaki are available today, including taiyaki and modern savory ‘ima‘s. Regardless of the type of filling, the batter, made of flour, eggs, sugar and water, is whisked together to a smooth consistency, and then poured into a metal mold and stuffed with either a sweet or savory filling. 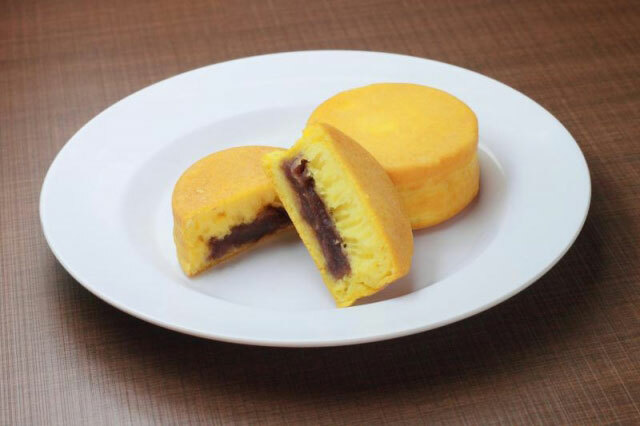 Imagawa-yaki are made in circular molds, and traditionally filled with sweet, red adzuki bean paste. Some traditional bakeries have innovated spin-offs of the original, even creating a chocolate covered pastry for the summer months! Taiyaki are also extremely popular, especially during Japanese festivals. Shaped like sea bream fish–which are thought to bring good luck—these pastries are filled with sweets, such as bananas and Nutella, custard cream or chocolate. 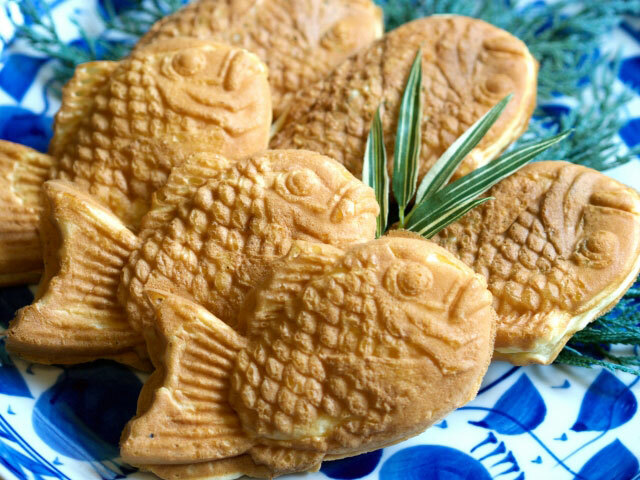 Connoisseurs suggest always getting the head side of the taiyaki, especially if you’re going to share, so you get the most of the sweet gooey filling! Although traditionally filled with sweets, imagawa-yaki pastries are now also available with savory fillings. Usually found at Japanese fusion bakeries in the United States, these pastries, called ‘ima’s for short, are filled with sausage and peppers, prosciutto and cheese, spinach, feta and sundried tomatoes, and even spicy chilies and meat. These fusion pastries are a modern, international twist on the classic pancake-like pastry! If you’ve had one of these, tell us about it! And if not… get eating! We continue our Essentials of Japanese Cooking series this month with a feature on miso… the so in ryori no sa shi su se so. Miso is a fermented paste made from soybeans, salt, either rice or barley, and a fermentation starter called koji. Used in miso soup, as a marinade, in dressings and sauces and a variety of other dishes, miso is an important staple in the Japanese pantry. Miso is said to have originated in China, as early as the 4th century BCE. It was introduced to the people of Japan by Buddhist monks who traveled from China and brought many new ideas that inspired and informed Japanese food culture. The way Japanese people began to produce miso refined it into a few varieties, each with a distinctive flavor and nutritional profile, texture and umami (the rich and savory taste of glutamate-based foods). Four main varieties of Japanese miso are available at most grocery stores in Japan, along with a few specialty gourmet types. 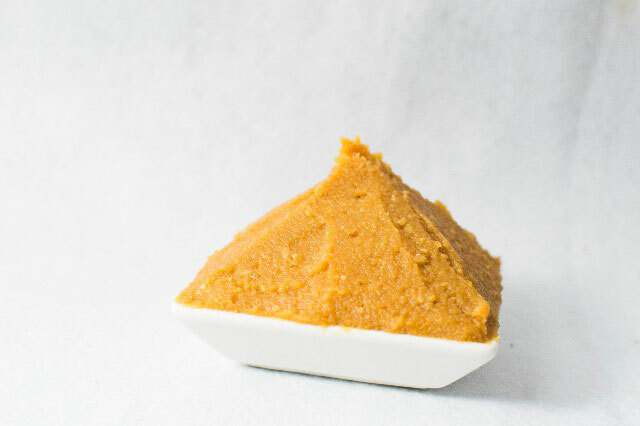 The main varieties include rice or ‘kome’ miso, which is the most commonly consumed variety, barley or ‘mugi ‘miso, pure soybean or ’mame’ miso, and blended ’awase’ miso, made with two or three types of other miso pastes. Each of these pastes are fermented from a few weeks up to three years, and the lighter varieties are more mildly flavored than the darker ones. Specialty miso pastes including hatcho miso, an all-soybean paste with a medium sweet/strength/saltiness profile, saikyo miso, a golden yellow paste with a naturally sweet, low salt flavor, and moromi miso, a chunky miso with the grains of rice or barley only partially crushed. Each of these specialty miso pastes are used in particular dishes, and not in general preparations such as miso soup or grilled fish. Miso is high in protein, the B vitamins, enzymes, Vitamin E, fiber, lecithin, isoflavones, peroxidase inhibitors and prostaglandins–all of which may help to nourish and regulate the body. Miso was a critical component of Japanese diets during lean times and famines, and it is still consumed almost daily by people in Japan. Traditionally, miso soup is enjoyed first thing in the morning, as part of a Japanese breakfast, to cleanse and nourish the body. (We have a great recipe for tofu misoshiru on our website!) The soup is made using a miso koshi, or small metal strainer, to create an even, smooth broth. Miso is also used in marinades and as a glaze for meat, seafood and vegetables, but must always be added to a dish either before or at the tail end of cooking, so the beneficial nutrients and the delicate flavor in the fermented paste are not destroyed by heat. Miso is most often used in marinades, sauces and dressings. When used as a marinade, miso helps to breakdown the proteins in fish and poultry, infusing them with umami and drawing out any acidity or bitterness from the animal flesh. Salmon and cod marinated in miso and then broiled are popular preparations for these healthful oily fish. Miso-Marinated Chicken Kushiyaki is a great way to broil chicken. When used in sauces and dressings, miso can be mixed with mayonnaise, ginger, sesame oil, honey, citrus and even spicy sriracha sauce. 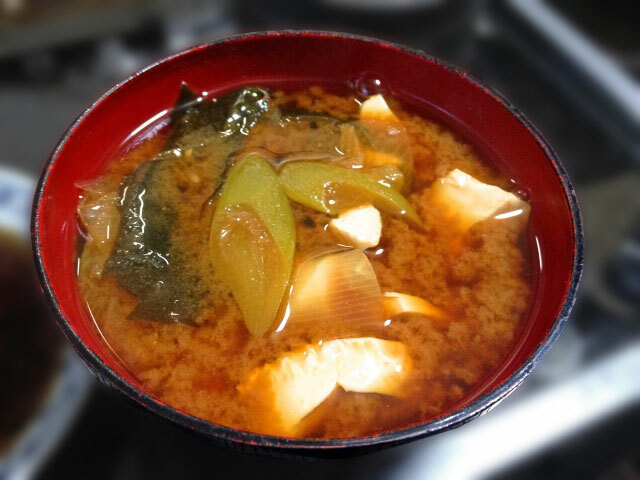 Miso is even used occasionally in simmered nimono dishes, called miso-ni, in which miso is blended with dashi, mirin, soy sauce and fresh ginger and then used to cook various meat and vegetables. One of our favorite recipes using miso is Beef Miso and Rice on Salad Leaf. The miso is used to impart a rich flavor to the sautéed ground beef and rice! Try it and tell us how it worked for you. In our next post, we’ll discuss cooking with sake and mirin, and give you some other great recipes to try out! As always, we’d love to hear about your experiences as a beginner with Japanese cooking, so leave us a comment below. We know you love the cute, colorful and very functional Zojirushi Stainless Steel Vacuum Carafe (SH-HA10), so we’re excited to tell you that we’re introducing the updated Stainless Steel Vacuum Carafe (SH-HB10/15) this month! The new carafe is available in 1.0 liter (34 ounces) and 1.5 liter (51 ounces) sizes. 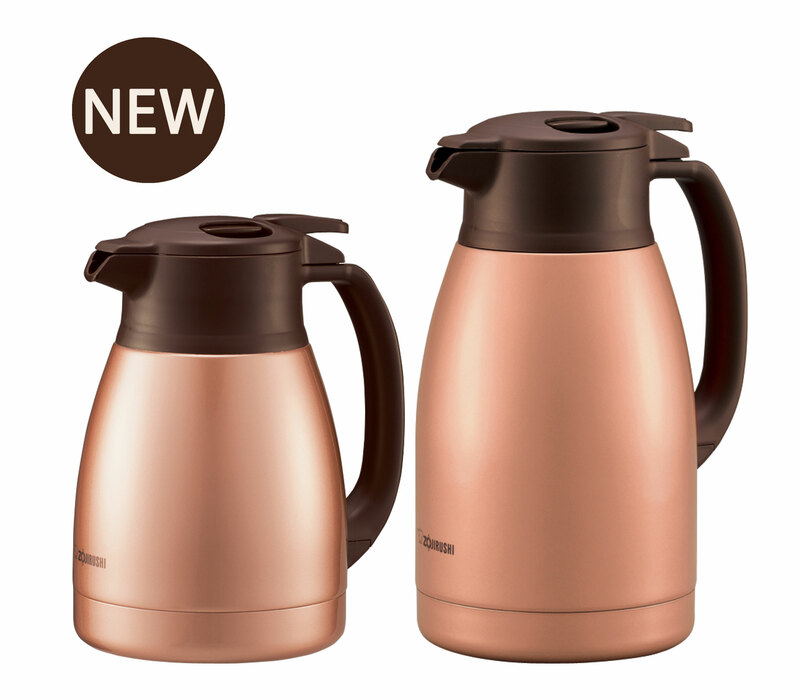 It comes in two colors—Stainless and Copper—and has all of the great standout features that Zojirushi prides itself on: superior heat and cold retention, 2 ½ inch wide mouth compatible with many direct brewing attachments, unbreakable stainless steel construction inside and out, easy-to-remove pinch-release lid and one-touch pour for easy serving. Of course, the new Stainless Steel Vacuum Carafe is easy to clean, too! So why do these features matter when you’re choosing a carafe? Cory DeNuccio said, “This is so nice and attractive for coffee on the patio! Or upstairs! Awesome quality! Holds about four cups! Keeps coffee piping hot! !” on May 12, 2015. And another Amazon Customer said “I’ve always been happy to make coffee with a simple Melitta cone drip system. But the glass carafe is easy to break. So I end up precariously perching a #4 cone atop random vessels. 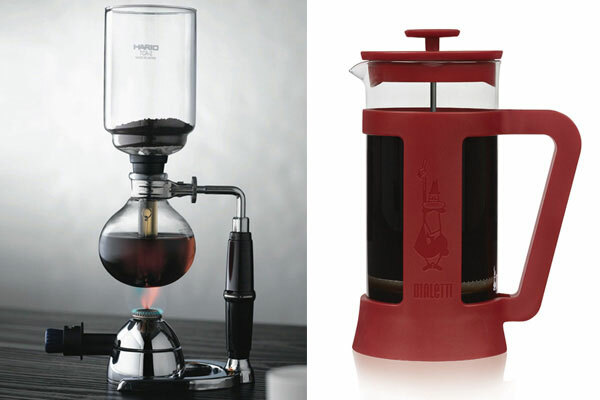 This carafe fulfills the promise “Accommodates most direct brewing attachments”. A nifty pinch-to-unlatch system makes it easy to remove the top. This reveals a wide & flat opening that easily supports a filter cone. The squat shape, rounded handle, & thumb latch make one-hand pouring a snap. What’s not to love?” on February 21, 2014. You can use it for serving guests, keeping your own tea or coffee hot throughout the day at the office, for RV travel, or for keeping cool, fresh water near your bedside at night. It’s a great, versatile product, and we hope you enjoy the new one, inspired by everyday life, and available now! We continue our series about rice this month with an exploration of medium-grain rice! Medium-grain rice is classified as such because of its size, with each grain measuring two to three times longer than it is wide (or, in more scientific terms, between 5.0 – 5.99 mm in length, and possessing a grain shape with a ratio of 2.1-3.0). When cooked, medium-grain rice tends to be moist and to stick together, although the stickiness varies depending upon how it is prepared. Asia produces the largest amount of medium-grain rice, but it’s a popular crop elsewhere in the world, as well. In the US, medium-grain rice is grown in Arkansas, California, Louisiana, Missouri and Texas. It’s becoming an important crop in Africa and Latin America, too. 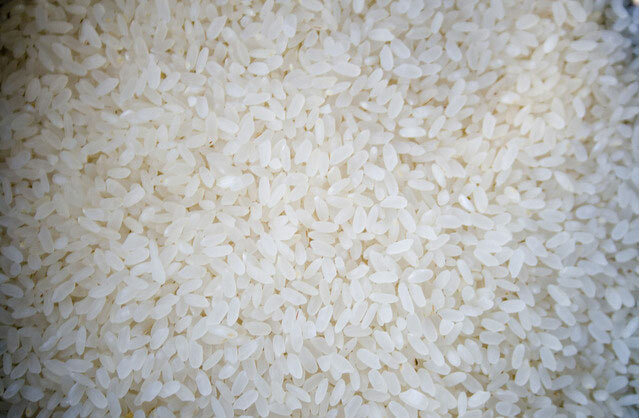 Different types of rice are suited to different types of cooking; for example, short-grain rice is the most common type used in Japanese cuisine, and long-grain rice, which we’ll talk about next month, is the most common type used in gourmet Indian and Middle Eastern dishes. Medium-grain rice also has its special uses. In Japanese cuisine, especially when made outside of Japan, medium-grain rice is often substituted for short-grain. It is also heavily consumed in parts of South India, the Caribbean, Sub-Saharan Africa, West Africa, Central America, South America and in parts of Europe—especially Italy, where it is ideal for risottos. In the US South, medium-grain rice is used in puddings and desserts. Medium-grain rice is used in some of the most delicious recipes! 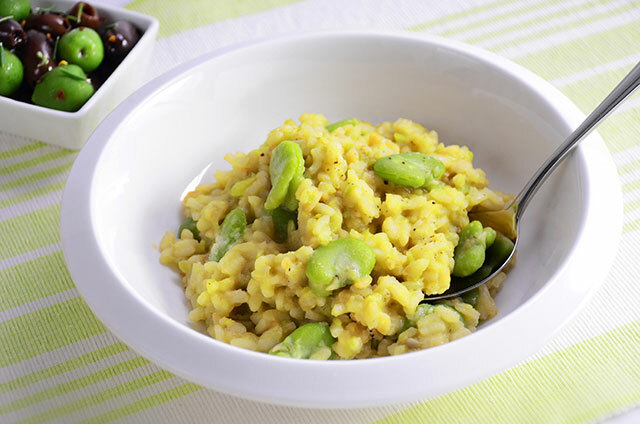 You can find an excellent recipe for Fava Bean Risotto, full of savory creaminess perfect for the spring crop of fresh fava beans. We also recommend this beautiful Arroz con Pollo, where the cook’s who’ve tried the recipe prefer using medium-grain rice to long-grain rice—and how about this spicy Cajun Jambalaya created by Emeril Lagasse? Don’t forget to finish it all off with this classic British Rice Pudding! Medium-grain rice is versatile, nutritious and perfect for so many kinds of dishes. We hope you enjoy these recipes and please let us know how they turned out. Stay tuned for next month’s post about long-grain rice and more great recipes!